Imagine what life would be like if you saw all amounts of money in terms of constant year 2000 dollars. Because there has been about 28% inflation since the year 2000, if your friend saw a jacket on sale for $128, you’d see the price as $100. While other people would see prices rising over time, you’d see the average prices of the things you buy stay roughly the same. Any cash that you keep hidden in your sock drawer would shrink slowly over time in your eyes. This change in your perception would have a number of interesting effects including your perception of investment risk. While most people would see their pay stay constant for the year and then step up at raise time, you’d see your pay cheque drop by a little each pay period. At raise time your pay would go up, but not necessarily back to what it was at the start of the year depending on whether your raise exceeded inflation. If you had a $10,000 emergency fund in a regular savings account that pays 1% interest (which is less than the inflation rate), you’d see the balance in your account drop slowly over time. The taxes you’d have to pay on the roughly $100 interest would be maddening because it would look to you like the interest rate was actually negative. In fact, for all your investments the part of the return that makes up for inflation would be invisible to you. You’d only see real returns (returns above inflation). But you’d still have to pay taxes on the invisible parts of the returns on your taxable investments. From your point of view, higher inflation means higher taxes on phantom income. When old people talk about the good old days in the 1980s when interest on savings was nice and high, you’d think they were crazy. After deducting the high inflation, returns on savings in the 1980s weren’t anything special, and there was the problem of paying taxes on a large amount of phantom income. You wouldn’t understand people who claim that government bonds are safe as long as you hold them to maturity to get a guaranteed payout. From your point of view, these bonds would pay the “guaranteed” amount minus an unpredictable amount of inflation. Standard annuities would seem crazy to you. Some financial advisor would suggest that you take your RRSP savings and buy an annuity that pays a fixed amount each month. But you’d see the monthly payments as dwindling unpredictably until there were almost guaranteed to be worthless after 30 years. For most people, fixed-income investing looks like a struggle to get the most guaranteed income possible, but to you it would seem like a struggle just to prevent your savings from losing value without being able to draw an income. For you, the only way to generate an income and simultaneously maintain the value of your principal would be with riskier investments such as stocks. For you to choose to stay with GICs, bonds, and other fixed-income investments in retirement, you’d have to accept that your principal will dwindle over time and hopefully not run out before you die. Currency-hedged ETFs would be quite puzzling. Your money would be invested in foreign stocks and you’d get their real returns except for an added (or subtracted) factor. This added factor would be the difference between inflation in your own country and inflation in the foreign country. As an added bonus, you’d lose a little of your return to tracking errors that come as a result of this added (or subtracted) inflation factor. Overall your perception of money would be quite different from other people’s perceptions. However, you’d see the financial world much more clearly than others. In the aftermath of the 2008 stock crash, the title of Derek Foster’s latest book The Worried Boomer: No Pension? Not Wealthy? Here’s YOUR Plan is some good marketing. Despite the promise of novel solutions to the problem of not being prepared for retirement, Foster offers sensible but fairly standard advice: spend less, save more, and work longer. Those who don’t like long books will be happy with 170 pages of large text and generous white space. A couple of the most common themes in the book are a recommendation to invest in dividend stocks and repeated plugs of Foster’s previous books. An amusing contradiction is that Foster’s web site and a couple of his previous books are called “Stop Working,” but he devotes a chapter in this book to the financial benefits of continuing to work past retirement age. One interesting fact I learned is that the Saskatchewan pension plan is open to all Canadians and not just Saskatchewan residents. Some people may prefer this as a lower cost option to saving in an RRSP with a mutual fund salesperson. Foster includes a “Retirement Action Workbook” that takes you through the calculation of your projected retirement income from various sources. He treats both dividends and interest income as retirement income, but this is misleading. With interest income, inflation is eroding your principal. With dividends, your principal typically grows enough to cover inflation (over the long run), but is more volatile. An 80-year old can afford to spend all the (after-tax) interest income, but someone who retires young can’t afford to erode principal in this way. This book is clearly written and uses language that is accessible to most people, but I suspect that most readers would be mildly disappointed. Gordon Pape devoted a section in his book Retirement’s Harsh New Realities to couch potato investing. I was quite interested to read it because it’s important to pay attention to criticisms of your investing strategies. If I only read books by proponents of my way of investing, I won’t learn much new. Unfortunately, Pape’s criticisms of couch potato investing were disappointing. Pape “agrees that the couch potato concept is easy to understand,” that “ETFs and index mutual funds are cheaper,” and that “the savings go straight to the bottom line in the form of higher returns.” However, Pape thinks that passive investing fails on “how safe the investment is and how much you will end up earning on your money” because of time horizon and human nature. Pape claims that passive investing requires a long-term view and that retirees “need to see profits sooner ... especially for those who depend on their investments to generate income.” ETFs and index mutual funds can be used to match the risk level of any combination of active mutual funds. Passive investing is not synonymous with heavy stock ownership. Investors requiring safety can choose a portfolio allocation that is heavy in bonds, GICs, or cash. Passive investors don’t get eye-popping dividends, but ETFs and mutual funds with high distributions do so by directly or indirectly returning investors’ capital; high incomes are illusory. On the human nature front, Pape observes that markets can be volatile, and that many passive investors could not have kept their nerve through the 2008 stock market crash if they were invested in his example ETF portfolio. However, investors in active mutual funds sold out at low prices during the crash as well. This isn’t an active versus passive argument; it is an argument about choosing an appropriate risk level. Pape closes with “while it’s true that you might do worse by actively managing your money, at least you, and not the markets, are in control of your financial fate.” However, few active investors actually manage their own money; they pay someone else to do this. These investors are at the mercy of markets and professional money managers. Any feeling of added control is mostly an illusion. The main things that investors can truly control are the level of risk they take on and the fees they pay. Over the long term, passive investors paying low fees are almost certain to get higher returns than active investors who take on the same level of risk. Almost everyone knows that the path to profits with stocks is to buy them at a low price and sell them at a higher price. Strangely enough, some smart-sounding advice amounts to the opposite strategy: buy high and sell low. This sounds smart until you break it down. “Stock markets going through a rough time” means that stock prices have dropped sharply in the recent past. “Moving some assets from an equity fund” means selling stocks. So, we can translate this advice into “Selling stocks after their prices have dropped sharply is only prudent.” So, we are told to sell stocks when their prices are low. Some may argue that a “rough period” refers to the near future of stock prices and the advice is actually to sell before prices drop. However, we don’t know when the stock market will drop. When the typical person speaks of a rough period for stocks, it is after prices have dropped, not before. We tend to assume that the near future will be an extrapolation of the recent past, but this doesn’t work for stocks. Typical investors would do well to admit to themselves that they have no idea what will happen to stock prices in the near term and that they still won’t know after listening to several “experts” with conflicting predictions. Then they will be able to see that some smart-sounding advice actually amounts to buy high and sell low, which is the opposite of what they really want. I haven’t included any articles about the Facebook IPO because I don’t care much about it. I would only buy IPO shares if offered the “friends and family” discount. Even then I might not buy them. Canadian Capitalist explains how restricted stock units (RSUs) are taxed. The Blunt Bean Counter says that additions to your cottage’s adjusted cost base may be CRA’s new target. Where Does All My Money Go? explains the advantages and disadvantages of holding your own mortgage in an RRSP. I had no idea there were so many fees involved. The idea of having to pay CMHC premiums to protect your RRSP against yourself seems strange. Presumably you’d raid your RRSP to avoid defaulting. Million Dollar Journey looks at various cheap options for replacing your home phone line. Big Cajun Man says that the only time you get taxed on the value of something you own rather than your income is with property tax. If MERs were a tax, then they would fall into this category too. Retirees face mandatory RRIF withdrawals, clawbacks, and increased clawbacks due to dividend gross-ups. Many retirees feel that the tax system is stacked against them, including Gordon Pape. Whether this is true or not comes down to expectations. In Canada, we have a number of programs designed to help subsets of the population financially. The favoured groups tend to be those with low incomes, children, and retirees. With OAS, GIS, and the age credit, it’s hard to argue that retirees have it worse than the typical working person under the age of 65. The only meaningful debate is whether retirees are favoured by an appropriate amount or whether they should be favoured more or less. In his book Retirement’s Harsh New Realities, Gordon Pape makes a number of points to justify his assertion that the tax system is stacked against retirees. Let’s look at each one in turn. Many retirees who saved diligently in their RRSPs for years are unhappy about having to pay taxes on their savings when forced to make RRIF withdrawals. I think the problem is that the tax breaks they received over the years are long forgotten and they come to think of their RRSP and RRIF balances as completely their own money. The best way to think of your RRSP savings is as partly belonging to the government. If your marginal tax rate in retirement will be 30%, then the savings in your RRSP or RRIF is only 70% yours. Your part and the government’s part grow together, and when you make a withdrawal, the government gets their cut. Few people like paying taxes, but RRSPs are a great deal even when you have to pay taxes on withdrawals. Wealthier retirees are unhappy about how much they are forced to withdraw from their RRIF each year. They complain that they can’t earn enough income to make the withdrawal and must dip into principal. The RRSP/RRIF system was not designed to allow retirees to maintain their principal indefinitely. People are supposed to draw down their RRIFs as they age. Further, you don’t have to spend the money that you withdraw; a great strategy is to save the amount you don’t need right away in a TFSA. You are required to pay your taxes, but you don’t have to spend your principal. Retirees with high enough incomes get hit with a 15% increase in their marginal tax rate in the form of an OAS clawback. Whether this feels like a hardship comes down to expectations. If you believe you are entitled to this money no matter your income level, then the clawback is maddening. However, we’re not talking about an extra tax on retirees; this is really a question of whether you get a benefit that younger Canadians don’t get. It’s possible to have a discussion about whether retirees should keep more of this benefit, but it’s hardly a case of retirees being singled out unfairly for higher taxes. This last part is worth repeating. The amount you keep after taxes is the same as if you received the larger amount and then paid taxes at your marginal tax rate. Using Pape’s example, if you received $100, and this gets grossed-up to $138, the amount you keep of your $100 is the amount you would have kept if you had earned $138 of regular income. Pape refers to the extra amount that you never really receive as a “phantom income.” He doesn’t like the way it increases clawbacks and affects other income tested benefits. I say you can’t expect to get credit for the taxes the company paid without using the grossed-up amount as income. Pape makes a very good point about dividends earned in registered accounts (RRSP, RRIF, TFSA, etc.). Even though your investments are supposed to grow tax-free, you never get back the taxes paid by the company that gives you dividends. This is an inconsistency in the way that dividends are handled. Of course, this hits all people with registered accounts, not just retirees. Pape makes another good point that when you offset capital gains against past capital losses, you still get hit with clawbacks. I don’t see why your taxes owing should be different if you offset capital gains with this year’s capital losses versus last year’s capital losses. I don’t believe that the tax system is stacked against retirees. In fact, they are favoured over typical taxpayers. I think it makes sense to favour retirees somewhat and we can discuss exactly how much they should be favoured, but this discussion won’t get anywhere if we start from the premise that retirees are being treated unfairly. Two people who each earn $100,000 per year generally pay less combined income tax than an individual making $200,000 per year. This creates a strong incentive for couples to find ways to balance their incomes. One way to achieve income splitting is to try to shift non-registered investments from a higher-earning spouse to a lower-earning spouse. The TFSA rules seem to permit a strategy for shifting assets between spouses. Let’s illustrate this with an example. Alice is a doctor making $200,000 per year. He husband Ted watches the children and makes no income. Over the years Alice has maximized her RRSP and TFSA contributions and in addition has built up significant non-registered investments that produce income. Unfortunately, this income is highly taxed in her hands. If the non-registered investments belonged to Ted, the couple would pay less income tax each year. However, if Alice simply gives the assets to Ted, CRA attribution rules say that the income derived from the investments would be taxed in Alice’s hands. If this works, then Alice could give $20,000 to Ted this year, $25,000 to Ted next year, and so on. After a decade, she could shift a total of at least $425,000 (more if yearly TFSA limits rise). It would then be Ted who declares interest, dividends, and capital gains on these investments each year. I’d be interested to hear expert opinions on whether this strategy would run afoul of income attribution rules, unfair advantage rules, tax avoidance rules, or any other problems. Perhaps I’ve been too hasty suggesting that people who spend too much are being foolish. Sometimes when I see people doing things that make no sense, I’ve later realized that I just misjudged their goals. Coaching and playing baseball and softball, I’ve seen plenty of players who ignore bunt signs and others who swing away on 3-0 pitches. I used to think that the remedy was to explain to them that their actions are reducing our team’s chances of winning. Sometimes this works, but often it doesn’t because some players don’t care much whether the team wins. They like hitting home runs and their actions are quite sensible once you understand that their goal is not team victory. Similarly, when I was young and naive, I would see the CEOs of the companies I worked for do things that were detrimental to the long-term health of the company. I thought maybe I was missing something or that the CEOs were misguided. Much later I realized that these CEOs were maximizing the near-term value of their stock options at the expense of the company’s future. Once again my mistake was an incorrect assumption about people’s goals. In the same vein, I looked for a rational explanation for overspending. It must be that these people love to work! While some people dream of retiring at age 60 or earlier, overspenders must relish the thought of working all the way through their 70s. If you see yourself at age 80 still waking up to an alarm clock and heading off to work, maybe going into debt to buy expensive cars and clothes you don’t need isn’t a problem after all. Mark Cuban has a very interesting take on rising tuition costs and how the growth of student debt is affecting the economy. He believes that the current college system in the U.S. will melt down. Rob Carrick published a letter from a young person struggling to find a first decent job. Whether you agree with the letter writer’s points or not, you do get a strong sense of the hopelessness that comes from not getting a chance to prove that you can work hard and do a good job. Larry Swedroe examines the “sell in May” market timing strategy. A clear look at the numbers is illuminating. Canadian Couch Potato explains why he has no faith in market timing strategies, even those that have tested well for decades. The Blunt Bean Counter explains the laws affecting the types of conditions you can attach to gifts in your will. It never occurred to me to try to manipulate mt children from my grave, but I suppose many try. Big Cajun Man came across an interesting TVO video with experts debating personal debt issues. Comments like “bite me” kept it lively. Canadian Capitalist gives a sector breakdown of various equity indexes and portfolios. Money Smarts shows that the odds don’t look good trying to come out ahead by selling your home to avoid the coming crash and later buying a new home at a lower price. Preet Banerjee continues his podcast series Mostly Money Mostly Canadian. Few investors understand how volatility in investment returns costs them real money. I did some simulations to try to explain where the lost money goes. In the hypothetical land of Volatilia, half of stocks return -70% each year and the other half return +80%. The problem for investors is that which stocks get each return changes randomly from year to year. There are a million active investors who each pick one stock every year and pile all of their savings into it. There are another million investors who use an index fund that owns all stocks in equal dollar amounts. Assuming that all investors add $5000 per year to their savings, each index investor will end up with $634,200 after 40 years. Mathematically inclined readers will realize that the active investors will end up with the same average result, but there will be winners and losers. On the surface, it seems like there is no real cost to trying the active route. You could end up with more money or less money, but the expected result is the same. However, the results of the simulation paint a very different picture. Of the million active investors, over 95% end up with less than the index investors’ result of $634,200. In fact, about half of them end up with less than $24,800! So, if the active investors end up with the same average savings as the index investors, where did all the money go? A partial answer is that there were 54 active investor billionaires. About 1 out of 30 active investors became decamillionaires, and this group ended up with 75% of all the active investor money. So, the bulk of the active investor money was shifted to a few very wealthy investors. When it comes to investing for the long term, the median result is much more important than the average result. An active investor should focus on the median figure of $24,800 rather than the average of $643,200. It is the index investor who eliminates volatility who can count on the larger amount. Of course, in the real world the results are not this extreme, but the same idea applies. Reducing volatility isn’t just about sleeping better at night; you’re likely to end up with more savings as well. Joshua M. Brown paints an ugly but entertaining picture of the inner working of Wall Street and how they sell investments to retail investors in his book Backstage Wall Street. It’s illuminating to see how large firms can take fresh employees who start with an interest in helping their clients, and drive these employees to treat retail investors as marks and sell them bad investments. The book begins with a foreword and introduction that try to sell the book so hard that I almost stopped reading. The definition of terms up front along with a history lesson on Wall Street didn’t help either. Fortunately, I made it to Chapter 5 for a story about brokers enduring morning motivational speeches screamed by a 300-pound man dubbed the “Mountain of Misinformation.” In my opinion, this is where the book should have started. The rest of the book from this point was an entertaining and illuminating read. A particularly interesting chapter was on the “straight line pitch,” a set of scripts used by stock brokers on cold calls to prospective clients. I wasn’t expecting much, but was surprised at how effectively they countered the main objections people would have to investing with a stranger on the phone. I could imagine being taken in by this pitch when I was younger and more naive. A funny chapter begins with a phone call where he argues with an ETF provider about whether inverse ETFs are “built for crackheads and traded primarily by crackheads.” The contrast between the logical reasoning and the insulting language just added to the fun. This book can hardly be called balanced, but it does provide a small counterbalance to the investment industry’s marketing machine. Overall, I think the important message is that the investment industry can take decent people and drive them to sell you investments that are bad for your investing health. There are good financial advisors, but you should start with a healthy dose of skepticism. softball team prior to the charity challenge match. Jose Canseco accepted a home-run derby challenge from beer-league ball player Evan Malamud, and the event snowballed into a fundraiser for the autism unit of CHEO (Children’s Hospital of Eastern Ontario) held Saturday May 12th. 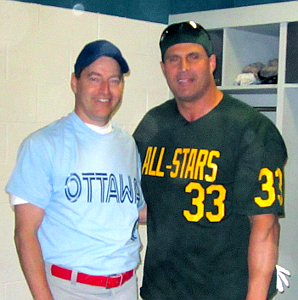 In the warm up and home-run derby, Canseco wowed the crowd by knocking both baseballs and softballs a long way out of Ottawa’s baseball stadium. There were no official measurements, but even the softballs flew well over 400 feet. Following the derby, Canseco’s All Stars played a softball game against Malamud’s beer-league team (including yours truly). Despite falling behind early, the All Stars made a big comeback and won the game on a Canseco grand slam that flew so far over the 380-foot sign that guesses on its total distance ranged from 440 to 500 feet. Hitting a baseball that far is difficult enough, but blasting a softball that far is truly impressive. Kudos to Malamud for pulling such a successful event together in just a few short weeks, and thanks to Jose Canseco for waiving his usual appearance fee to support a worthwhile cause. Rob Carrick did an interesting analysis of how difficult it is for young adults today versus what it was like in 1984 when he was young. I think the most important factors are current tuition costs and the difficulty of finding work today. It’s easy to find something where you’re called in for a couple of 4-hour shifts per week, but it can be difficult to stitch together 30 or more hours of work per week. Young people today don’t do themselves any favours by hemorrhaging money on snacks, sugary drinks, and junk food, but on the whole I’d say they have it tougher now than it was in 1984. Robert McLister has some important information for anyone considering buying a home with only 5% down. Larry Swedroe explains how public sector defined-benefit pension plans put taxpayers in the investment guarantee business. Don’t be fooled into thinking this is just an American problem. The U.S. has bigger problems, but Canadian taxpayers are in the investment guarantee business as well. The Wall Street Journal says that Americans are warming up to the idea of renting a home. It’s ironic that this should happen while housing prices are so low in much of the U.S. It’s Canadians who should be looking at renting because of high house prices, but we’re obsessed with home ownership. Hat tip to Rob Carrick for pointing me to this one. Million Dollar Journey shows how he got nearly half off the best available Expedia price on a car rental. Big Cajun Man is no fan of the credit card cheques mailed to him every month. Larry MacDonald says that the Canadian health care system needs reform. Retire Happy Blog has some good reasons why you should formalize the loans you make to your children even if you love and trust them. Where Does All My Money Go? says that the cost of smoking is equivalent to blowing up multiple Porsches. But can you really put a price on doing something that your parents don’t want you to do? By the time you’re too old to worry about defying your parents, you’re hooked. When it comes to slicing a pie, the idea of a half is pretty simple, and most of us would agree on whether the pie has been cut roughly in half. But with long-term investing, our sense of scale can fail us, and we can easily disagree on what it means to have half as big a return. Suppose that a 25-year old receives a $10,000 gift from her grandparents and chooses to invest the money in a stock index and not touch it until she is 65. If the stock market returns 10% per year, she will end up with $452,600. Now what if she only got half of that return? What does “half” mean here? One interpretation is that she gets only a 5% return each year. We might think that she will end up with about half as much money. The real answer: $70,400! What a difference. To end up with half as much money ($226,300), she would have to make 8.1% per year. A little 1.9% gap over 40 years cuts her final savings in half. When it comes to making long-range investing plans, don’t place too much trust in your intuition. Small differences can matter, and “half” doesn’t always mean what we think. Your Total Debt Service Ratio (TDSR) is the percentage of your gross income that covers your basic housing costs (including mortgage) plus payments on consumer debts. Most lenders prefer this to be below about 40% of your income. But does it make sense for this to be based on your gross income? 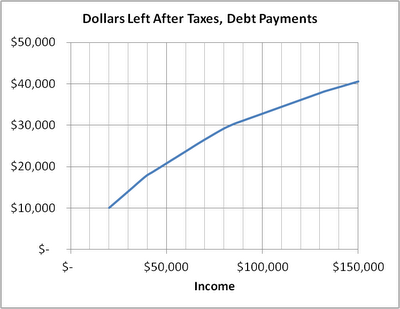 After all, your tax rate increases as your income increases. 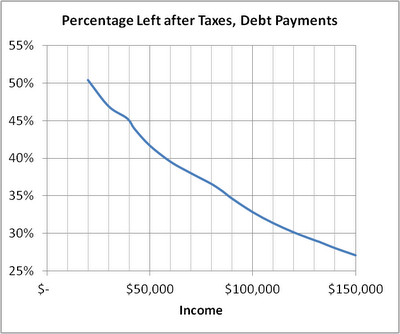 At a $20,000 income, you’re left with about 50%, but for a $150,000 income, you’re left with only 27%. On the surface, this doesn’t seem to make sense. Shouldn’t the TDSR take into account tax levels so that the maximum TDSR permitted is lower at higher incomes? 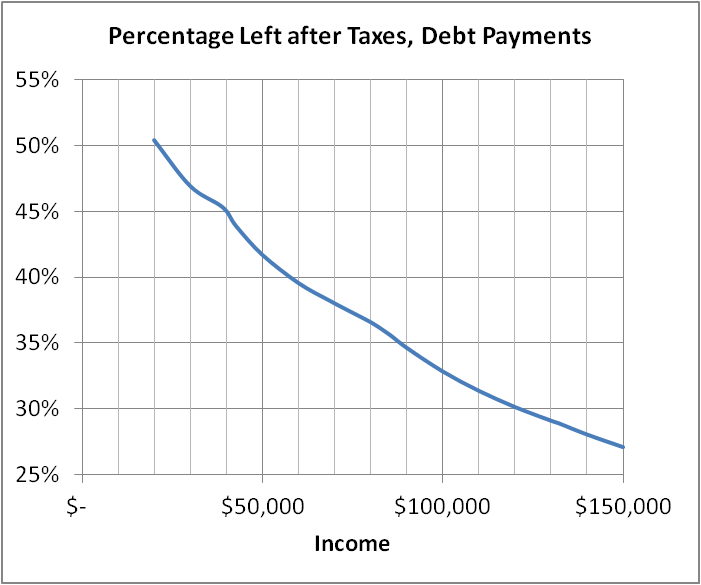 This chart shows that even though the percentage of income left over drops, the number of dollars left over increases. 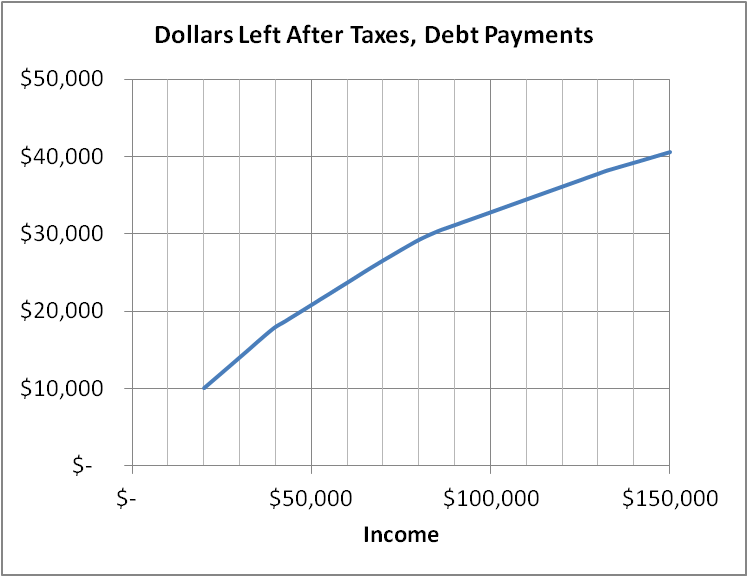 At an income of $20,000, you’ve got only about $10,000 left for other expenses, but at an income of $150,000, you’ve got about $40,000 left over. The bottom line is that as your income increases, lenders are willing to let you allocate a higher percentage of your take-home pay to debt servicing, but they know that you’ll still have more money available for other expenses. Personally, I find a 40% TDSR to be frighteningly high. My Own Advisor says that he’s more comfortable at 30%, and I’m even more conservative than this. Borrowers would do well to think this through and form their own opinions before blindly allowing lenders to take them to a 40% TDSR. Bruce Livesey paints a picture of the Canadian investment industry as a Wild West in his book Thieves of Bay Street. His detailed stories about the people involved in corruption among public companies, brokers, bankers, and regulators are a compelling read. I’m not prepared to declare our future doomed, but it is clear that we need more effective regulation. I didn’t always agree with the book’s characterization of problems. Livesey quotes William Lazonick complaining about companies “maximizing shareholder value” at the expense of “creation of jobs.” The purpose of a business is to make money for its owners. Creating jobs is a side effect. We need laws that govern how workers can be treated, but we can’t look to businesses to put worker interests ahead of the interests of owners. I think most of the problems we have are with attempts to boost short-term share prices. If we can find a way to discourage businesses from seeking the short-term gains that come with creative accounting and leveraged buyouts, the interests of owners and workers will be much better aligned. While quoting statistics to illustrate how wealth is becoming more concentrated, Livesey states that middle class wealth has “shifted into the hands of the most affluent” and they “lend this money back to the very people who were now scrambling to pay everyday bills.” The implication that wealth comes from stealing from ordinary people is not one that I can buy into. No doubt it is true in some cases. And I agree that huge disparities are societally undesirable. But I don’t buy that most wealthy people are crooks. Those who are crooks should be punished, but I refuse to demonize all wealthy people. Stock analyst Ross Healy makes the interesting claim that “analysts don’t read financial statements,” and that “as few as 5 percent of analysts every consult a company’s balance sheet before making a recommendation.” If true, it’s hard to imagine why anyone should pay attention to analyst recommendations. Livesey closes saying that we are “hostages of a system that can only lead to ruin.” I can’t buy that we are doomed. The many stories in the book of life savings stolen by thieves are truly horrific, but I don’t think this is the fate awaiting most of us. After reading all the personal stories of tragedy, the reader can be forgiven for considering stuffing his life savings in a mattress, but I think the right answer is to remain optimistic, be wary, and work toward more effective regulation. Raghuram Rajan has a very interesting essay on why the west can’t borrow and spend its way to recovery. He argues that for decades our prosperity has been driven by increasing debt and that this is unsustainable; we have to find a path to real growth. Hat tip to the Stingy Investor for pointing me to this one. Tom Bradley at Steadyhand has a very interesting list of 5 things that need to change in the wealth management industry. Canadian Mortgage Trends gives a thorough discussion of Flaherty’s musings about privatizing CMHC. I don’t know enough about the issues here to have an opinion one way or another, but I am skeptical of CMHC’s stress tests that “imply a 1 in 200 probability of insolvency.” I just don’t believe that this can be measured accurately. Canadian Capitalist reports that RBC Direct Investing is simplifying its administration fees. Preet Banerjee launched a new weekly podcast series called Mostly Money Mostly Canadian. I love the cartoon image of Preet. Big Cajun Man wants to start a new television show to dish out tough love to people who use payday loan services. Do we get to hit them with bats, too? My Own Advisor explains why he wants to have a $10,000 emergency fund. This in combination with access to some available credit seems like a good idea. Retire Happy Blog highlights the differences between pension splitting and CPP splitting. Canadian Couch Potato reviews Alan Fustey’s book on the shortcomings of financial models. Money Smarts says that to truly win a house bidding war, sometimes you have to walk away. A reader directed my attention to Meridian Canadian Market Secure GICs (the web page describing this GIC has disappeared since this article was written). This is a GIC whose interest payment is linked to the performance of the Canadian stocks making up the S&P/TSX 60 index. They claim that the “principal is guaranteed,” that “members participate in 100% of return,” and “the participation rate is currently set at 100%.” This sounds too good to be true. Before finding the fine print, the marketing claims make it seem like investors can’t lose money, but get 100% of the upside of stock investing. Savvy investors know there must be a catch somewhere because banks (or a credit union in this case) don’t give away free money. It turns out that the catch is in the “method of calculation” that I found after some digging (but has since moved again). When you buy stocks and hold them for 5 years, what you pay is the stock price at the beginning, and what you get is the stock price at the end of the 5 years. With this GIC, what you get is the average price level over the 5 years. So, if the index goes up 8% per year, instead of making 8% on your GIC, you’ll actually get somewhere close to half of that. But it gets worse. The S&P/TSX 60 index doesn’t include dividends. So, even if the stocks make a total return of 8% per year, you’ll only get about half of the capital gains and none of the dividend return. To make this more concrete, let’s assume that the stocks make a total return of 8% each year for 5 years, but that 3% of this is dividends. Then the index will rise only 5% per year. The average month-end closing value of the index over 60 months works out to 12.6% more than the starting value of the index. So, the total GIC return is 12.6% over 5 years or 2.4% per year (compounded). Somehow a 100% participation rate in 8% stock returns turns into only 2.4% on the GIC. What percentage of people who buy this product do you think understand how low their actual participation rate will be? The majority of do-it-yourself investors that I know are stock-pickers. Among techies, the big debates are whether Apple stock will go much higher or just higher, whether Google has run out of steam, and where Facebook is headed. While they disagree on many points, one thing unites most of these stock-pickers: they protect their egos by never figuring out their investing returns. There are many ways to compare your returns to an index. I used to work out my returns on different subsets of my investments and over various non-standard lengths of time, and only recently I calculated my yearly returns on my complete portfolio and compared them to an appropriate benchmark. Another approach was suggested in a comment by reader Gene: “every time I make a purchase, I simulate an equivalent purchase in the S&P500 index.” Then he can just compare his real portfolio value to the simulated index portfolio value. The majority of stock-pickers carefully avoid all such methods of determining if they are any good at picking stocks. These ego-protecting investors can stand proudly with lottery players, many of whom are sure that they’ve made money on lottery tickets over the years. I’m thinking of just closing my eyes the next time I’m driving on the highway because I’ll be able to imagine that I’m staying in the middle of my lane. Wish me luck. Investing can be very simple. In fact, all the decision-making can be coded into a spreadsheet. The complication comes when you decide that you want to try to make more money than your neighbours. Here is one formula for investing long-term savings. Pick a few broad low-cost index ETFs to cover the world’s stock markets and bond markets. Choose percentages for each ETF and how these percentages will change as you approach retirement. Code up a spreadsheet to tell you where to place new money to maintain your percentages and to when to rebalance if necessary. Then for the next few decades, do whatever the spreadsheet tells you to do. All the complications come into investing when you try to go for more than your “fair share.” One obvious attempt to outperform is poring over annual reports trying to picks stocks that will give above-average returns. But other perceived complexities of investing stem from attempts to outperform as well. If you ask whether stocks are going to drop because you’re considering selling some of them, you are implicitly trying to outperform. At any given moment, someone owns each share of stock. When the market goes down 10%, the average invested dollar loses 10%. So, if you’re trying to avoid this loss, you’re trying to beat the market. There is nothing wrong with beating the market if you can do it. The ironic thing is that the majority of people who put in serious effort to try to beat the market will actually lose to the market due to added costs such as commissions, spreads, and taxes. If you decide to let go and just take what the market offers, your investing life can be very simple.